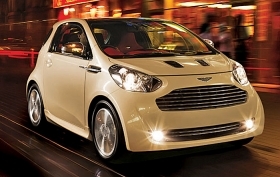 The Cygnet has Aston Martin's characteristic design language, including signature details such as the metal grille. Aston Martin said it will start production of its Cygnet city car in April at the company's Gaydon plant in England. The Cygnet will be sold through the luxury sports car brand's European dealer network. The company is already taking orders for the car, a spokeswoman told Automotive News Europe. Aston Martin said it hopes to extend market availability by 2012 to other countries including the United States. The Cygnet will cost 30,995 pounds (about $49,300) in the UK and 37,995 euros in Germany. It will offer buyers a choice of standard manual or optional continuously variable transmission. The Cygnet is based on Toyota's iQ model. The iQ costs 11,900 euros ($16,089) in Germany. Aston Martin said the car has generated "a huge level of interest" among existing Aston Martin owners and customers new to the brand. The company calls the Cygnet a "bespoke luxury commuter car" with ultra-compact packaging and low-emission engine technology, and extremely high levels of interior finish. Standard equipment will include ABS, nine airbags, stability control, electronic brake assist and retractable door mirrors. Inside, the vehicle will offer keyless entry and start, heated seats, satellite navigation and a full leather interior. Launch editions will include a Bill Amberg five-piece luggage set specifically designed for the Cygnet, said the statement. The Cygnet will be the eighth major production car Aston Martin has built at its Gaydon plant since 2004, and will be assembled in a new facility by the same work force that build Aston Martin's other cars, the company says. Just a little larger than the Smart ForTwo, the Cygnet is a major departure from the automaker's usual big, high-performance sports cars. Last year, the company said it hoped to sell about 3,000 Cygnets a year worldwide. In 2007, after two decades of ownership by Ford Motor Co., the British luxury sports car brand was sold for $674 million to a group of investors led by Kuwait's Investment Dar.